Week Thirty Nine of My Weekly Creative Challenge and Mother's Day Too! Well let me start with an Happy Mother's Day wish to all of you moms out there and I would love to say Happy Mother's Day to my mom, Katie B. Without her(and my Dad), I would not exist! This week is the week to show off Nature and the use of Mixed Metals as well. As I have stated in earlier blog entries, I don’t work with brass as much as I work with copper or silver and for 2010 this will be changing. 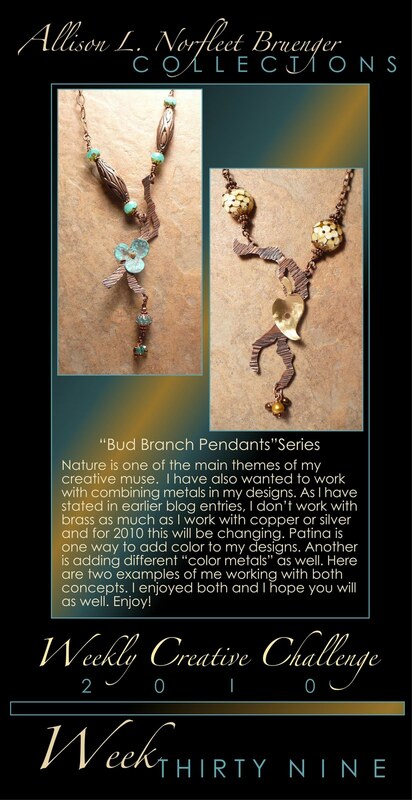 This week I wanted to show samples of both patinas and the use of mixing metals to give my pieces that extra something. I really liked the way the brightness of the brushed finished brass worked with the liver of sulfur textured copper. I enjoyed working in both of these techniques and I hope you will enjoy the "Fruits of My Labor" as well.